Offering benefits to your employees is vital as it shows them you are invested in not only their overall health and Compensation but their future. A solid employee benefits package can help to attract and retain talent. Benefits can help you differentiate your business from competitors. Oracle HCM Cloud Benefits helps you to Attract and Retain your top talents, by adopting the world class solution. 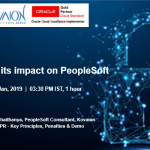 Kovaion invites you to take part on the glimpse of how can you leverage the full importance of employee benefits by adopting the niche Benefits management tools available in the market. 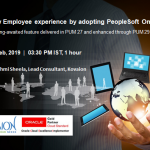 Oracle Benefits Management is one such application which offers a very helping hand to employees during their tenure or during so important Life events. Life events are basic changes both Personal or Work related changes like promotion, marital status change etc. The entire process can be monitored and regulated with the Benefits Service Center tool by Benefits Administrator sitting at their desk via analytics and dashboards. Isn’t it great to know about the benefits of this Benefit Management. 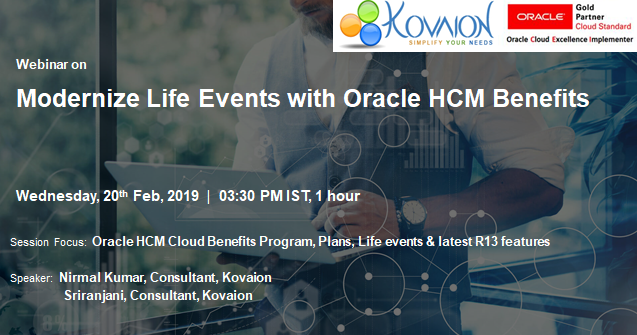 Please join us for an informative session on Oracle HCM Cloud – Benefit Management & its latest features. Speaker(s) : Mr. Nirmal Kumar & Ms. Sriranjani, Kovaion.